Happy Thanksgiving to everyone!! As I wait for my dear husband to get home from work, so we can have our Thanksgiving dinner I thought I'd take the time to post one of my latest projects. I made a Fall banner back in October which I loved dearly and it's been up for two months. Last week, I decided it was time for a new banner so I started on a Christmas one. I had a hard time making up my mind what paper to use for it but ultimately decided to use the Holiday Treasures Designer Series paper from Stampin' Up! 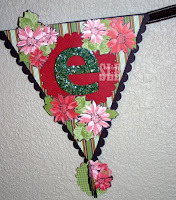 I just love the poinsettias in this paper and knew it would be perf ect for my banner. I used the now retired On Board Simon Lower letters (how I wish they were still available) and covered them in Old Olive Craft Ink. I immediately (while they were still wet) covered them in Heat & Stick powder and heated it up then dumped the Celery Chunky Sprinkles glitter on top. This made them really nice and sparkly, just perfect for the holiday season! 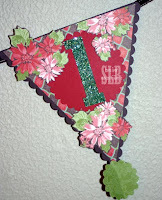 The banner was cut out using the Stampin' Up! exclusive Big Shot Pennant die. I have really grown to love this die. 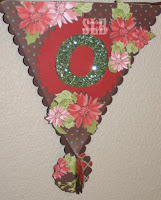 I used Textured Chocolate Chip cardstock for my backing and then the Holiday Treasures DSP for the inside part of the banner. I used the large scallop Big Shot die for the scallops and then mounted my letters on those. The scallops were cut using Riding Hood Red cardstock. The pom pons on the end are also made using the Pennant die. I cut out the poinsettia pieces from one sheet of the DSP and then used dimenionals to pop them up. I really love the way they look! The banner is strung on the Chocolate Chip felt ribbon from the Alpine Ribbon Originals which is offered in the Holiday Mini Catalog. Below you will see the individual letter pennants. I didn't think to take them before I strung them up, so I'm sorry about the weird angles. I hope you enjoy this fun project! I really loved making it and know it will keep the Stampin' Spot bright and cheery the whole month long! Have a great rest of the day everyone and safe shopping tomorrow!! Sharon, you're projects always have the 'wow' factor! I love your banner. Just got my Big Shot and will have to CASE for sure! Beautiful!! I'm so excited I get to make my first stamp club meeting of the year on Sunday afternoon. It will be a tight day with church in morning and evening and choir practice at 4:30, but I'm so excited to be stamping again! So pretty, Sharon -- I hope you all had a wonderful Thanksgiving! Seems like forever since I spoke to you last. Wishing you a wonderful holiday season!